In the hidden object adventure Samantha Swift and the Hidden Roses of Athena, Samantha Swift is back and this time the brilliant archaeologist travels to Athens to look for the Scepter of Zeus, whose location has mystified her colleagues for years! Unfortunately, after successfully tracking down the Scepter, it was stolen by a shady rival. But… not all is lost. Upon return to the Museum of Secrets Lost in Samantha realizes that the shield she found in Athens is part of the legendary roses of Athens! Legend has it that the goddess Athena bestowed six virtues on Athens in the form of roses: wisdom, art, skill, industry, conquest and justice. When the roses are united in the shield, the bearer will posses god-like mastery of the virtues. However, fearful that such power would fall in the wrong hands, a high priestess ordered the dispersal of the roses to a location foreseen in a vision. And so Samantha’s adventure begins when she starts looking for all six roses; from the ancient baths of Rome to the jungles of Guatemala, the mountains of Tibet and chilly London. Each of the six chapters has amazing and beautiful hand-drawn graphics and is filled with several hidden object scenes; such as finding artifacts in a construction site in Rome, looking for golden coins in a temple or searching for a pair of pliers in the Louver in Paris. 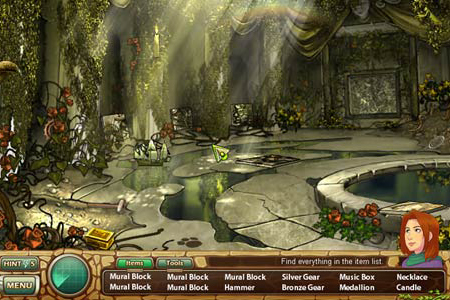 All hidden object scenes are split into two: first you must find a list of hidden objects, then some get scraped of your list and others – like a hammer or a brush – get added to your inventory and you must use them at a later stage to reveal special hidden objects. 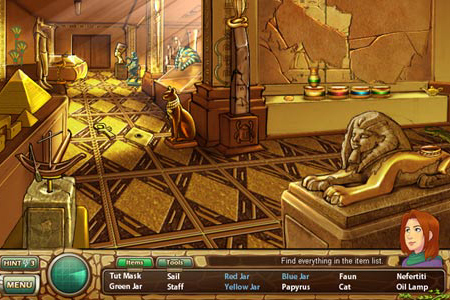 After all the items have been found a final secret is revealed in the form of a mini-game, which you must solve in order to leave the room. All mini-games are unique to the location Samantha is in, for instance assembling a golden statue in Rome or designing a Zen garden in Kyoto. And of course there are the mini-games that result in finding an actual rose like a match three game where the goal is to turn all the tiles in the background gold, after which a rose can be collected. While the game isn’t timed, rapid clicking will break Samantha’s scanner… however, as nothing really happened as a result of this (trust me, it broke several times during my game play), I’m not entirely sure what the consequences are. Of course, if you do get stuck looking for those tiny little objects you can always use up one of your hints to reveal the location of an item. And, to avoid running out, you must make sure you are collecting the hidden lightening bolts throughout the game. The best thing about this game is that every scene is unique and while you do need to cross over some scenes various times, it is elegantly done and doesn’t feel repetitive. Overall, this fun hidden object game is thoroughly entertaining and would surely make for an adventure-filled few hours! 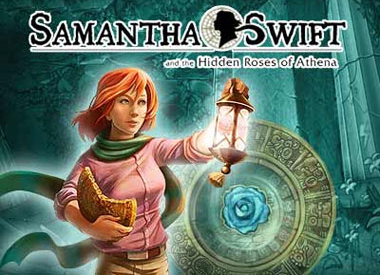 Download and play Samantha Swift and the Hidden Roses of Athena for FREE! I have spent many hours of fun on my free ride games, however when ever I try and play Samantha Swift and the hidden roses I have trouble the arrow till not follow my cursor, was wondering if any one else has had this problem. It is a great and different challenge. All games gives me release from all of my anger i have inside of me,from being doged over and over again. I have the same problem with the cursor as Lois. Thanks so much for your really great game site. Free Ride games are the best, but I really love Mumbo Jumbo games, especially the Samantha Swift games. I like the games and I don’t mind the advertisements. 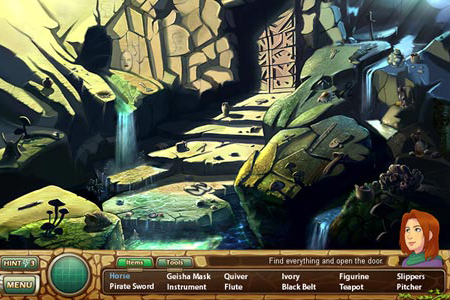 However, on the Treasures of Montezuma; there are two continuous video and audio adds that run throughout the game. You can’t understand either when they both play at once, they run over and over and over, and it’s quite annoying. A person thinks, “who would want to buy a product that is so annoying”. It used to be the adds ran after several minutes of playing, then back to the game. I’ll check back in a week to see if they’re still there – if so, I’ll find other things to do. 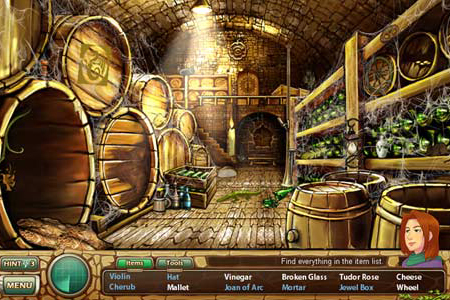 Really enjoyed Samantha Swift games I’m hooked on hidden object games.